It’s 1981 and the band Gillan, fronted by former Deep Purple vocalist Ian Gillan, created a ripple of excitement amongst the teenage rock fans at my school when they burst into the charts with a cover of New Orleans. One of the things that seemed to make this far more than just a heavied-up version of an old rock ‘n’ roll number was the guitarist, Bernie Tormé. He looked like a punk, acted like a hippy, sounded like Hendrix and seemed different from anyone around in rock and metal at the time. Tormé was soon gone from Gillan and, after a very brief sojourn with Ozzy Osbourne, he formed his own band and started hitting the smaller venues circuit. That’s where I first caught him live. And in similar types of venues now, he’s still out there gigging as well as recording. Hot on the success of his crowd-funded Flowers & Dirt double album last year, he’s used the crowd-funding formula once again and has a brand new album to promote, Blackheart. First, though, he opens with a storming version of Wild West, the standout track from one of his early solo albums, Electric Gypsies. He has a really strong band in Chris Heilmann (bass) and Ian Harris (drums percussion) and the power trio format suits Torme’s style of music perfectly. Well, of course, why wouldn’t it? The fuzzy feedback-laden guitar is combined with well-written, accessible tunes and vocals that give an honesty and meaning to the lyrics. From the same era, the excellent Turn Out The Lights also gets an outing. It’s not just about nostalgia, though, and songs from both last year’s Flowers and Dirt album and this year’s Blackheart both feature prominently. It’s not all blistering hard rock, either. As on the recent albums there’s some lighter, bluesier, folkier moments, including Flow from the new album and the excellent Spirit Road from Flowers and Dirt.. Soon, however, we are nearing the end with an explosive set of Gillan songs, including the one that got me hooked on Tormé’s guitar-playing in the first place, New Orleans. At the very end of the set, friend of the band and the man who first helped Torme get the crowd-funding venture off the ground, Peter Cook, joined the band for an encore after pledging to “buy” a guitar solo as part of the crowd-funding appeal. In a big arena gig with big corporate sponsors this could sound like the tackiest thing in the world. In a small intimate venue of this size, however, it’s genuinely fun and there is no doubting Cook’s evident passion both for Tormé’s music itself and for helping him secure a viable recording career in this challenging era for the music industry. Indeed, compared to the old record company model, the crowd-funding approach has allowed Tormé to connect very directly with fans and even re-connect to those, like me, who had fallen by the wayside and previously lost touch with Tormé’s career. A mention, also, for the Bordeline. 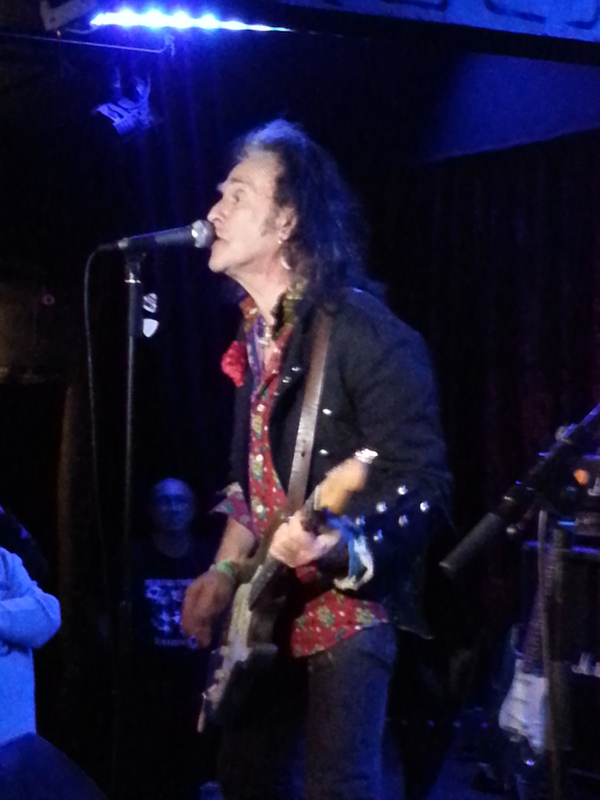 While numerous other live venues in the West End have closed their doors, this 300-capacity venue has held its open now for over 20 years, always with a stirling line-up of acts throughout the year and the perfect setting for Bernie Tormé tonight. Look forward to reading your piece – and well done for organising the Q and A Saturday afternoon. Sounds like quite a show. I always thought that Gillan lost a significant part of their interest when Torme left.